OS grid reference: SW 4264 3494. 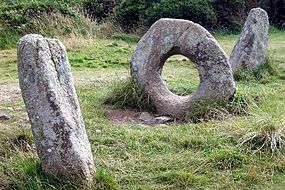 On the moors about halfway between Morvah and Madron, in Cornwall, stands the late Neolithic monument known as Men-an-Tol (the holed stone), with three standing stones and one now lying down, dating back to between 2,000-3,000 BC the late Neolithic to early Bronze-Age. This alignment of stones lies on a moorland footpath which branches off a track just to the west of the site. Here there is an alignment of three standing stones, the central stone (the Crick Stone) has a very large hole, while the fourth stone is recumbant; there may have been others here when the site was much bigger – quite a bit of the monument having been robbed-away over the centuries, prior to which it may have formed a circle of stones. Nearby, there are other prehistoric sites of interest. Madron village is 3 miles to the south-east, the town of Penzance is 3 miles to the south, and St Just is 4 miles to the south-west. The three standing stones are all roughly 1.0 to 1.2 metres (3 foot 5 inches to 4 feet) high, the large ‘perforated’ hole in the central, round-shaped stone being 0.5 metres (1 foot 6 inches) in diameter (though Borlase, in 1749, says it is 1 foot 2 inches), and each stone is about the same distance apart (8-9 feet); the western-most stone was moved to its present position in the early 19th century and aligned with the others – along with the recumbant stone there are five or maybe six other outliers buried in the ground close-by, which make-up this circular ancient site, covering upto 18 metres (59 feet). To the south-east there are the faint earthworks of a cairn, its low mound just visible. Over the last two hundred years or so antiquarians have often ‘pondered,’ and been ‘rather puzzled’ as to whether these standing stones once formed a much larger stone circle and, some go even further, in thinking there was once a burial chamber or mound here, though today there are no signs of either of these, very sadly. The holed-stone was obviously used for fertility rituals and, maybe even magic, and the pointed stones next to it being ‘phallic in shape’; this being borne-out through the folklore and customs of the locality and its people in ‘days gone by’. The well-known authors Janet and Colin Board in their book ‘Mysterious Britain’, 1984, say that: Many of these stones are supposed to be helpful in curing certain illnesses, and children were once passed through the Men-an-Tol when they were suffering from rickets. Stones with holes big enough to crawl through, and with similar beliefs attached to them, can be found all over the world. There may once have been some benefits to be gained from such customs, …….certain stones can hold powerful currents passing through the earth, could not the hole serve as a focus for this power, which would pass into the body of, and give renewed vitality to, anyone climbing through the hole?” Young people would come to the holed-stone in order to consult the stone (oracle) with regard to their future love life, and two pins would be placed like a ‘cross’ on top of the stone and then they would, hopefully, move in a certain way. “This was interpreted in answer to a question put to the stone,” according to Bill Anderton in his book ‘Guide To Ancient Britain,’ 1991. Young children with tuberculosis, rickets and spinal problems were passed through the holed-stone three times, while a ‘childless’ women would have to crawl through the hole nine times to receive a cure. After that, hopefully they were cured! There are several other important prehistoric monuments close by, the closest to Men-an-Tol being Men Scryfa Standing Stone half a mile to the north, and The Nine Maidens Stone Circle, 1 mile to the north-east. And 2 miles south stand West Lanyon Quoit and the more famous Lanyon Quoit. Bord, Janet & Colin., Mysterious Britain, Paladin Books (Granada Publishing Ltd)., London, 1984. Anderton, Bill., Guide To Ancient Britain, Foulsham & Co. Ltd., London, 1991. Darvil, Timothy., Ancient Britain (Glovebox Guide), The Automobile Association (The Publishing Division), Basingstoke, 1988. Categories: Standing Stones | Tags: Men-An-Tol near Madron in Cornwall | Permalink.